Prototype: Swiss Federal Railways (SBB/CFF/FFS) elvetino, Inc. (a subsidiary of the SBB) type WR standard design car (Mark IV). Model: The car is ready for installation of 7319 current-conducting couplings or 72020/72021 current-conducting couplers. The interior lights can be powered from the pantograph on the roof. The buffers are adjustable. Length over the buffers 26.4 cm / 10-3/8. DC wheel set 4 x 700580. The 90 SBB dining cars with an elvetino restaurant run in the Intercity and ICN route network in Switzerland as well as in neighboring countries to Hamburg, Munich, and Vienna. 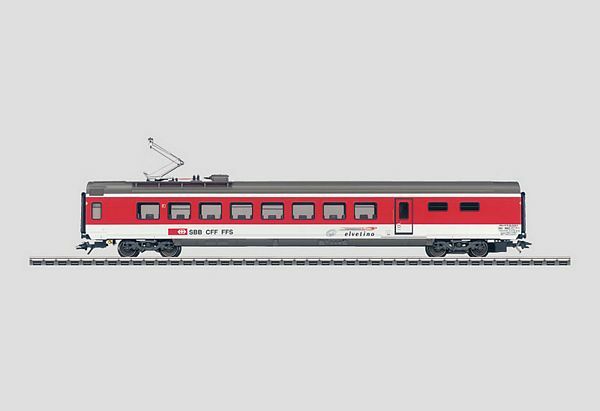 This dining car can be added to the 42166 set with the current Mark IV express train passenger cars.